The Amar Wool Rug has been beautifully handmade in India by craftsmen and women who have passed down their skills and knowledge through the generations. 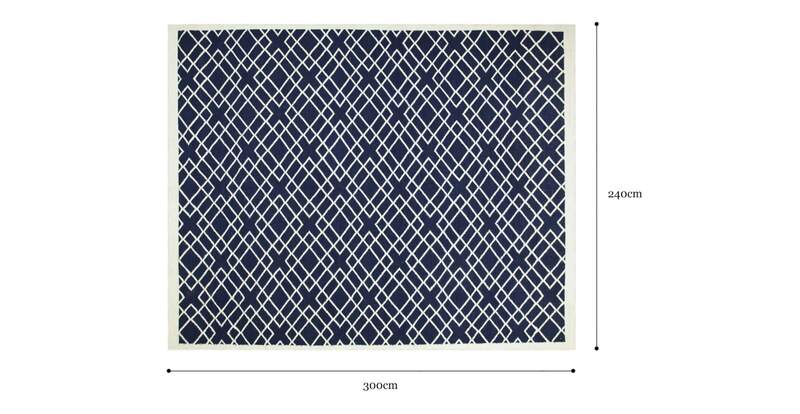 A gorgeous blend of deep navy and cream, the piece works well in a range of interiors. Carefully hand selected wool has been chosen for each Brosa rug, ensuring the highest standards. Undergoing an expert production process, each piece has been washed and woven for the ultimate softness and exceptional durability. Comprehensive quality checks were made throughout the making of the Amar to ensure each piece is suitable for extensive every day use. Shop the complete range of rugs from Brosa, which are available in a variety of colours and patterns. With an on-trend and timeless design, match the Amar Wool Rug with a range of sofas and lounges from Brosa. With Indian craftsmanship that is second to none, this piece is guaranteed to be looking great in your home for years to come. Love brosa designs prices and delivery and so easy to put together and furniture looks great!